"Why the Archbishop of Westminster is wrong about welfare: Our plan for Britain is not just about saving money, but about doing what is right". Apparently the Tories are very confident that the electorate back their welfare cuts. In his letter to the Telegraph Cameron trotted out some of the key angles used to keep us voters onside. We take a closer look at these. "in London there were people claiming truly astonishing sums of £60,000, £70,000, £80,000 a year." The reality, shown in a report done for the Department of Works and Pensions in 2011, is that only 160 people out of 4.8 million benefited from a handout of more than £50,000 for housing benefit. That is fewer than 1 person in 30,000. 96% of claimants received less than £10,000 per year. 2) There are people claiming Disability Living Allowance who are not disabled. "A system where hundreds of thousands of people were put on Incapacity Benefit and never reassessed, essentially taken off the books and forgotten about." Then Peter said, “Silver or gold I do not have, but what I do have I give you. In the name of Jesus Christ of Nazareth, walk.” Taking him by the right hand, he helped him up, and instantly the man’s feet and ankles became strong. He jumped to his feet and began to walk. Cameron used a different method to make the disabled abled. He changed the definition of 'disabled'. Prior to the reforms one was eligible for transport related benefits if one could not walk more than 50 metres at a time. By changing the rule to not being able to walk more than 20 metres, as if by miracle thousands of people's "feet and ankles became strong" and they were sent out to walk unaided! 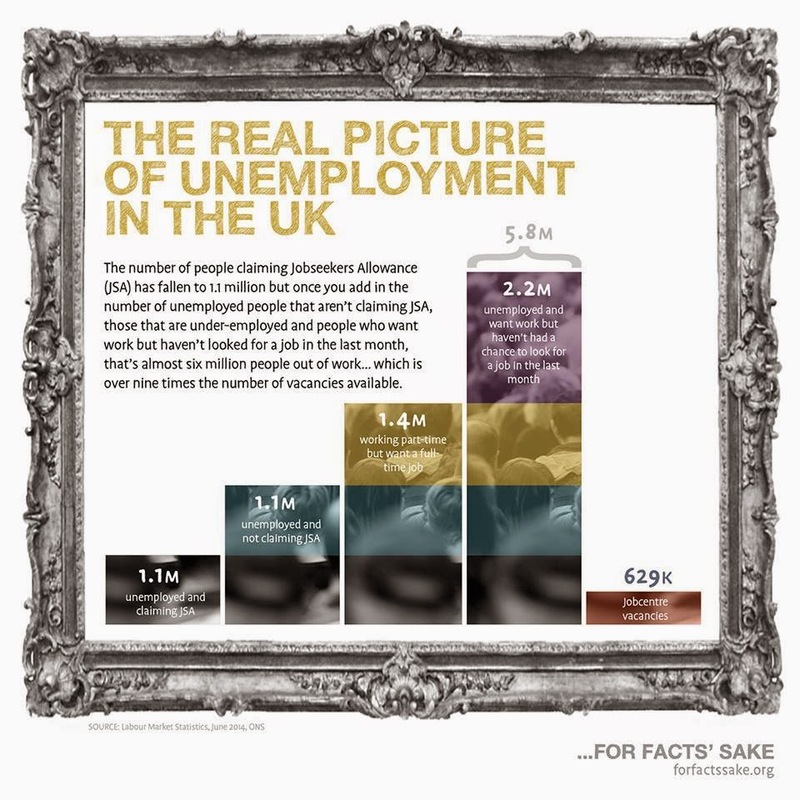 3) Cutting benefits will starve the lazy unemployed into getting off their sofas into one of those 500,000 vacancies. "Whatever your religious or spiritual perspective, I believe very firmly that it is wrong to penalise those who work hard and do the right thing while rewarding those who can work, but don’t." Less than a quarter of Housing Benefit recipients are unemployed, according to figures from the DWP. More than a half are pensioners and employed people. In the year to September 2013 nearly 900,000 people had their benefits stopped. "figures showed that in the past year nearly 900,000 people have had their benefits stopped, the highest figure for any 12-month period since jobseeker's allowance was introduced in 1996. In recent months, however, 58% of those who wanted to overturn DWP sanction decisions in independent tribunals have been successful. Before 2010, the success rate of appeals was 20% or less." The high rate of decisions being overturned by independent tribunals must be galling to Cameron. But they are sharper than a serpent's tooth at the Department of Works and Pensions. You would expect no less from the people who reduced the number of disabled people claiming travel benefits by redefining 'disabled'. The Guardian got its hands on a leaked DWP document, in which it is proposed to charge people a fee to appeal against DWP decisions. Taking money off people who have been denied money because they don't have any money will surely bring down the number of appeals. "Seeing these [benefits] reforms through is at the heart of our long-term economic plan – and it is at the heart, too, of our social and moral mission in politics today." Another Hoorah for Tory morality! Good read on the myths used to justify cutting benefits: "The lies we tell ourselves: ending comfortable myths about poverty"
Having changed the definition of 'disabled' to magically make thousands of people 'abled', the Office of National Statistics has come up with the same wheeze. They are changing the definition of 'saving' . With no more money in our pockets we will have become richer. "The ONS will also count future pension rights as if they were present income. With Britain boasting a large funded defined-benefit pension scheme, the move will raise measured household incomes and the savings ratio. " "Tory plan to redefine child poverty as figures set to show first rise in decade"
"Ministers have been criticised for broadening the definition of “affordable housing” to include so-called starter homes costing up to £450,000 — 17 times the average British salary. Critics claimed that the change, inserted into the Housing and Planning Bill, will make it harder to scrutinise the government’s progress in delivering genuinely cheap housing for workers. “Instead of building more affordable homes, they are branding more homes as affordable,” said John Healey, the shadow housing minister. The Tory government has invented a category of “starter homes”, restricted to first-time buyers under 40, to be sold at a discount of at least 20 per cent of market price of less than £250,000, or £450,000 in London. Shelter, the homeless charity, has estimated that starter homes will be unaffordable to people on low incomes in 98 per cent of the country, and unaffordable to those on middle incomes in 58 per cent of the country. "